Should a politician act upon practical necessity or be guided by theory? Cicero (1st century BCE) has several philosophers debate this question in ?On Public Affairs? (?De re publica? ), ending with the ?Dream of Scipio?, a vision of heavenly glories awaiting selfless politicians. Macrobius (5th century CE) commented on the 'Dream? through the lens of contemporary philosophy which argued a superior transcendent reality. 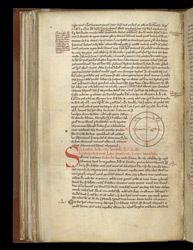 The commentary?s mysticism and its views of geography (proposing a round earth) appealed to medieval theologians. This manuscript?s handwriting style and inclusion of verses by Rhygyfarch (Ricemarch), poet of St David?s, link it with Wales. In his dream, Scipio sees the earth divided into upper and lower regions. Macrobius shows a diagram of the divided earth, relating to his view that the earth had two continents divided by an ocean. The red writing signals the beginning of a section. Medieval Christian theologians considered the commentary a key to how the structure of God?s creation influenced events and human actions.